Be the first to share your favorite memory, photo or story of Lourina. This memorial page is dedicated for family, friends and future generations to celebrate the life of their loved one. 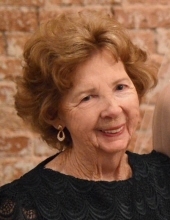 Lourina Francis McGhee, 88, of Palm Desert, CA, passed away the evening of March 24, 2019 at Eisenhower Health Hospital in Rancho Mirage. She was born December 15, 1930 to Edgar and Mary Etta Ball of Pennsboro, WV. The family suggests that donations be made to the Fibrolamellar Cancer Foundation. The Lucy Curci Cancer Center in Rancho Mirage, CA, or The Desert Art Center Scholarship Fund, Coachella Valley. To send flowers or a remembrance gift to the family of Lourina Francis McGhee, please visit our Tribute Store. "Email Address" would like to share the life celebration of Lourina Francis McGhee. Click on the "link" to go to share a favorite memory or leave a condolence message for the family.